This Large Format Display Table Stand provides a wide variety of features for most table top installations of large flat panel TVs. Accommodates most 32″ to 50″ displays. 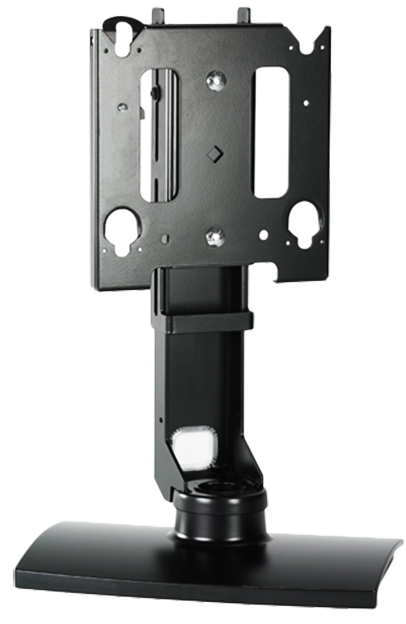 Height adjusts 5″ (127 mm) upward with stable mounting, quick release and optional security. This has telescoping height adjustment, with five display height adjustments in 1″ increments to allow for difference screen heights up to 32″. It has a smooth swivel up to 45° in either direction, perfect for optimum user preference. Integrated cable management conceals cables. This is great for infection control, while being safe and secure, perfect for many hospital environments.